Tony Hawk's Pro Skater 2 is a skateboarding video game, the second in the Tony Hawk's series of sports games. It was developed by Neversoft and published by Activision in 2000. It was first released for the PlayStation, with subsequent ports to the Nintendo 64, Dreamcast, Game Boy Advance, Mac OS, Microsoft Windows, and iOS. 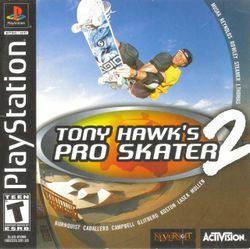 It also was released for the Xbox on November 15, 2001, under the name Tony Hawk's Pro Skater 2X. The game received widespread critical acclaim and remains one of the highest rated video games of all time. This page was last edited on 30 May 2016, at 14:38.